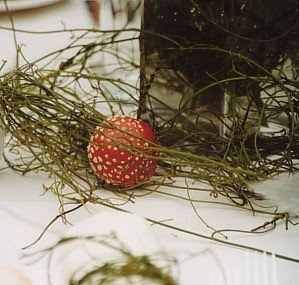 In a lovely old country garden in Moss Vale I set up this tablesetting for a Christmas Lunch, I ran around the garden and found these amazing red wild mushrooms under the pine trees, they became the focal point of the decorations. I discovered some Devils Ivy growing off a tree so I picked enough to use down the centre of the table. Devils Ivy is great to use for so many different things. Here I wrapped the napkins with the Devils Ivy and I also stuffed it into the glass vases before putting the lillies in. Everyone received a little gift in these green paper bags that I folded over and tied with ribbon and decorated each one with a Lilly each. Very simple and quick to set up. p.s.- so glad you are coming to the party! Lovely lovely lovely!!! Quite weird that you have summer on winter though :) Planning on spending the next Christmas together with my sister in Sydney! Think if we could meet, that would be just fantastic!!! A big hug and Merry Christmas to you and your family! Minna :)p.s you're playing my absolute favorite (and only) christmas album!! !